Officials are reviewing various ways to restore the iconic building. That raises the question about older churches here in the tr?state? And how they're prepared in case of a fire. Historical churches have stood for decade? Providing a place of worship for many. For one indiana congregation?the fire at notre dam? Brings back memories of a fire of their own. "in 1902 that community really came together in a big way." Saint boniface parish in evansville is the second oldest standing church in the area. And with the recent fire that broke out at notre dame in pari? The congregation recalls a striking similarity that hits close to home. "in 1902 lightening struck the church on easter eve or holy saturday and burned the top out. The steeples fell, the windows fell in, the floor fell in and all that was left was the walls." Two steeples similar to the one in pari? Gone the only thing not engulfed by flame?the walls and some valuable articles. "large open structures are very difficult for firefighters to combat." Boniface was restored a year late? But putting out fires in older historic buildings like churche?is never easy. "the fire is going to spread very quickly and when it is a large space that goes vertical obviously heat rises, fire goes up, and as it catches the structure on fire and the elevated areas makes it even more difficult for us to fight that fire." But local congregation s like st.
Boniface are doing everything they can to minimize the opportunity of a fire from sparking. 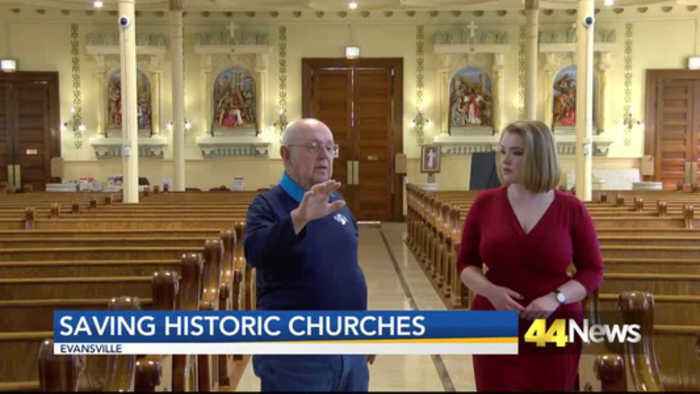 Candles are located in a concrete are?and only in the church during service, important papers and artifacts are in a safe room, firehouses are located just a few blocks away, and the diocese has a committee to provide input to the congregation s during times of construction or renovation. "that committee will provide input on for example building materials that might enhance fire protection, construction techniques that might enhance fire protection." And with a plan in plac? Boniface hopes to keep history alive for years to come. "we think our fire system will help tip it off if we do have a problem like that." The diocese of evansville continues to work diligently with all the parishes to ensure they are as prepared as possible for any disaster on an o?